I recently have become interested in the exact form that increases and decreases take. I’d like to build up a better understanding, so that I can choose the best increase or decrease for a given situation, and get the effect that I desire. So I’ve been swatching a bit. 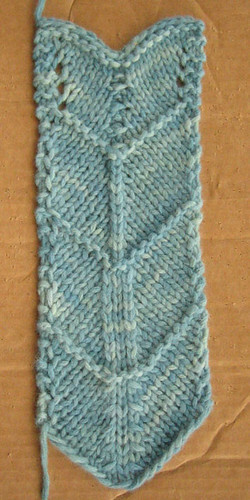 This first swatch shows paired decreases. In this swatch, I’m just looking at the way the fabric looks when you decrease with right-leaning decreases (K2tog) or left-leaning decreases (SSK) or with a symmetrical central decrease (Sl2-K1-P2sso). 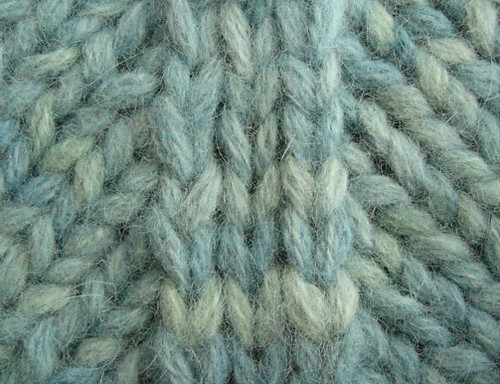 This one is the result of a left-leaning decrease, knit stitch, then right-leaning decrease. It was created by doing: SSK, K1, K2tog, which I repeated every right side row. I think it is interesting to note that the K2togs (on the right side of the central knit stitch) are much more invisible/integrated into the fabric than the corresponding SSK decreases, which do not seem to lie as flat. 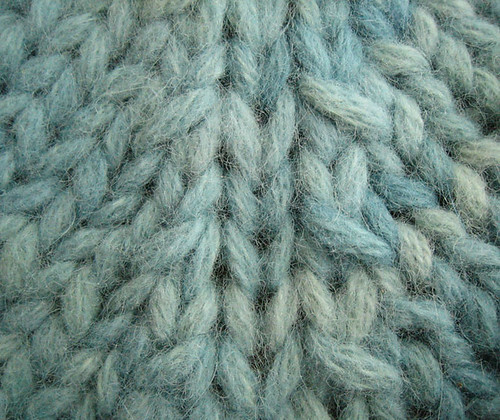 This one is the result of the opposite – a right-leaning decrease, then knit stitch, then left-leaning decrease. It was created by doing: K2tog, K2, SSK, on every right side row. Instead of being quite flat, this pairing of decreases creates a dominant line which actually stands proud of the adjacent knit fabric. The third section is a symmetrical central double decrease; Sl2-K1-P2sso. 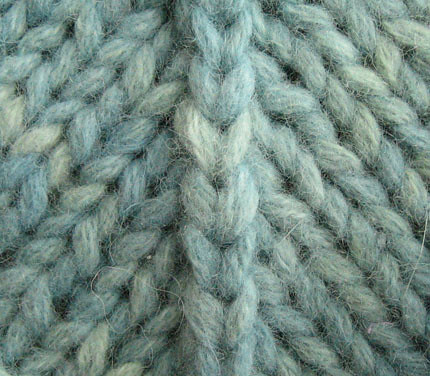 This is worked by slipping 2 stitches, knitwise, at the same time (as if you were going to K2tog), then knitting the next stitch, and then passing the 2 slipped stitches over the knitted stitch and off the needles. It is similar to the previous swatch in that it is a strong vertical line which stands proud of the surrounding fabric. In this case I have worked the Sl2-K1-P2sso decrease every right-side row. When you SSK, slip the first knitwise, then slip the second purlwise, they’ll lay flat like the k2tog. What a great resource, I’m bookmarking this one! Thank you! What did you do for the top decrease though, where it’s kind of sunken? That could have a nice effect I think, for certain projects. Great idea to study decreases like that. I tend to just follow a pattern. Understanding it thoroughly would be much better!